Every year it seems the same questions pop up about how the housing market will progress for the upcoming year…or not. This year holds a number of factors that could easily affect which way the market turns when it comes to buying and/or selling a home. Here are a few of the factors that could, at any given time, influence the current housing market trends. The possibility of more interest rate hikes. The continuous rhetoric about a housing bubble. WOW! There are a lot of potential variables. But does that mean you should let that influence your decision about buying and/or selling a home? The media uses fear-mongering to negatively report on things that might happen as a way to bolster their ratings, but there is an even greater chance those same things might not happen. The fact is…all of this is just a normal part of daily life and if you put everything on hold because of something that might happen, you could be waiting forever. So…let’s get on with it and concentrate on working towards the future we do want and not focusing on what negative things the future might hold. We can start by looking at the 2019 real estate market forecast, trends, and what it all means for sellers and buyers. Here are several national real estate trends to watch. The number one issue most people are concerned about this year is the interest rates and whether or not they will continue to rise. Interest rates have been rising, which has been the trend for the last two years; however, they are still lower than they were in the last eight years or so. Interest rates are not going to go back down to three and half that your friend got a couple of years ago. If anything, many have been predicting interest rates will continue to rise and that there will be several interest rate increases in 2019. The Fed has, at least temporarily, stated they are putting any new rate hikes on hold. So that is good news. 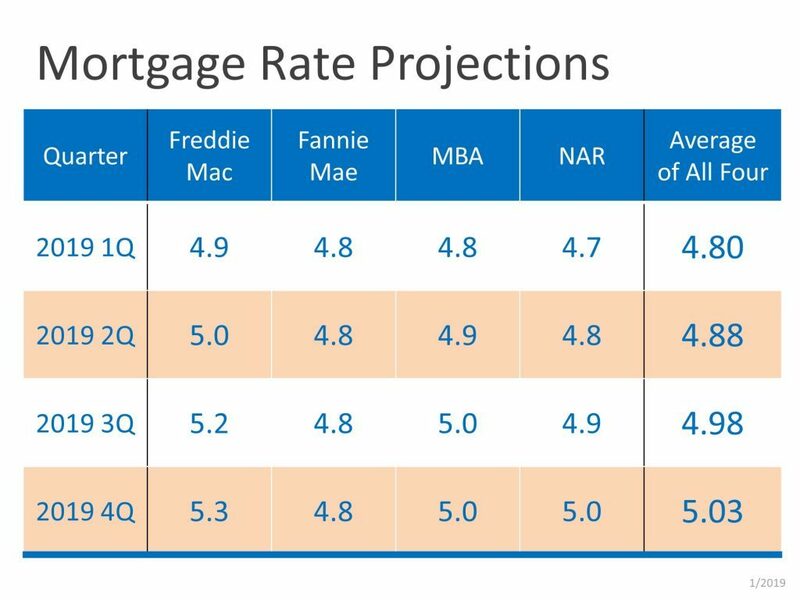 Below is a chart of projected interest rates for 2019. Due to the possibility of rising interest rates, the experts are predicting home sales will begin to decline by about 2%. That means, after several years of record number growth, home sales will probably be slower for the real estate market in 2019. However, as you know, anything could happen, so it remains to be seen if this is how it will play out. While inventory for 2019 will still be low (less than 7%), there won’t be quite as much of a shortage as there was in 2018. This is partially due to the higher interest rates, but it is also due to the fact that there are more homes being put on the market, as well as more inventory of newly constructed homes. However, with that being said, most of the inventory gains have been in luxury and upscale homes that are in high-growth markets. Experts such as Goldman Sachs predicts the U.S. house prices generally achieve a soft landing. Due to the growing inventory of homes, it is believed home appreciation values will slow to about 3% if the inventory of homes continues to increase. More millennials are now buying homes in numbers greater than Gen Xers and Baby Boomers. Millennials are older now and settling into their careers, not to mention their median household income has jumped to more than $88,000. So it only makes sense that they are moving towards buying their first homes. This is perfect timing because Baby Boomers are downsizing which has left an inventory of available homes behind for the millennials to scoop up. Now let’s take a look at the Florida housing market trends. The Florida housing market is predicted to do well in 2019. The available inventory and the corresponding prices are remaining in check. The strong economy in large metro areas such as Lakeland, Tampa, Miami, Orlando, Jacksonville, and others indicate consumer confidence. This not only leads to increased home buying, but it also leads to increased tourism as well, both of which are great for the economy in Florida, especially its large metro areas. When you look at Florida home prices compared to those in New York and California then couple that with the no state income tax and other low tax rates here, expect to see more and more people moving out of those high tax areas and move to Florida. This is good news for home sellers and for the outlook of our economy going forward. 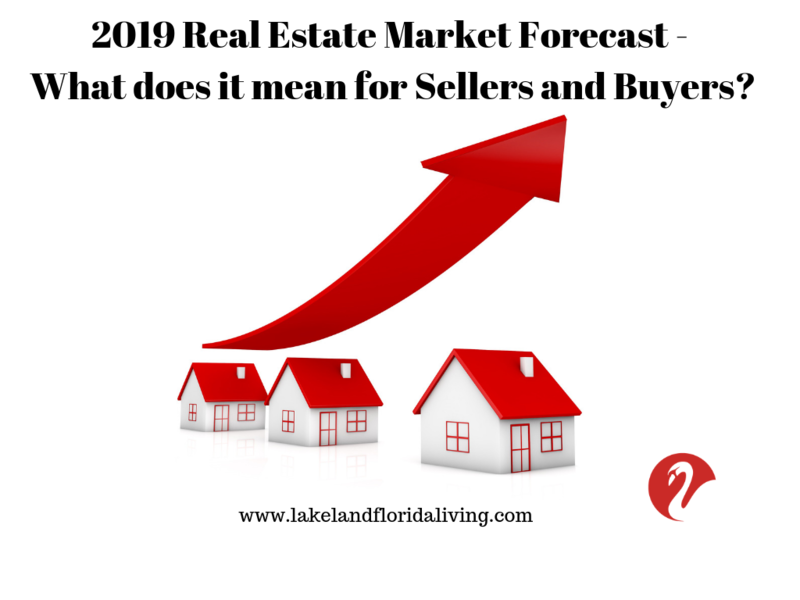 This all sounds great…but what about the housing market trends for Lakeland in 2019? There is good news on the Lakeland home-front. The trends in Lakeland show an 8% year-over-year increase in median home sale prices. 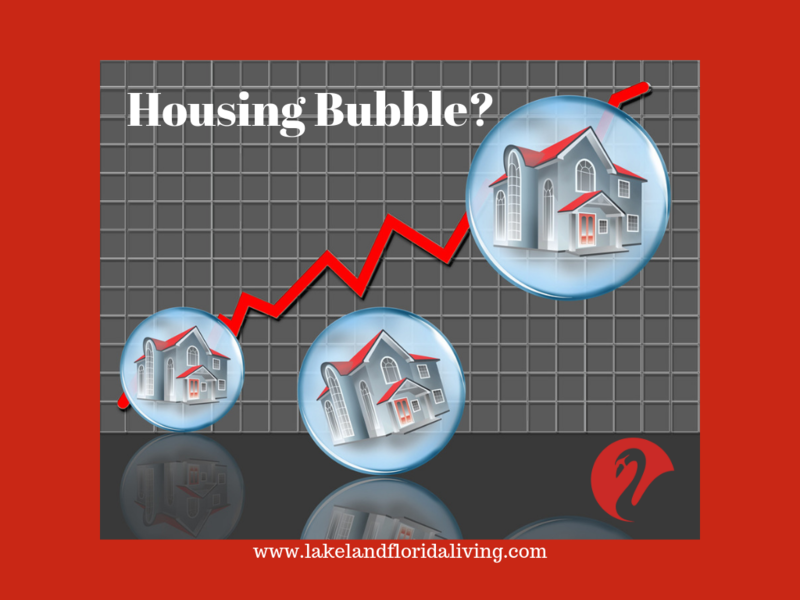 And while the housing market is slowing in some areas, that is not the case for Lakeland as this trend will continue into 2019. In fact, Realtor.com’s economic team is predicting the Lakeland market is going to be hot…really hot! Because the economy in Lakeland is very strong and has multitudes of new home buyers moving in. That, and, because the inventory of affordable homes is low. Then, of course, you have Lakeland’s location which is smack-dab in the middle of the state centrally located to all the main tourist attractions like Disney. Great! But what about the numbers? OK, let’s look at the numbers comparing 2017 to 2018 for single family homes, villas, and townhomes. Here is a snapshot of the Lakeland housing market comparing 2017 to 2018. A more detailed statistics by Lakeland’s zip code lets you see the housing trend in real time. What Do These Trends Mean for Sellers? What these trends mean for sellers is due to the interest rate increases, homes will most likely receive fewer offers and stay on the market a bit longer. Not to mention the possibility of a rise in available inventory due to the increased home prices and interest rates have reduced buyer affordability. It looks like we are preparing for a very soft landing in prices back to normal appreciation levels, not depreciation we experienced 10 years ago. As I mentioned before, as more homes come on the market, there is more competition. Sellers should focus on setting a compelling list price and not overprice their home waiting for the market to catch it. When it comes to millennial home buyers, there are a few things sellers need to be aware of if they do not want to alienate this segment of the market, because millennial home buyers approach the home purchase process a little differently than other generations. For example, millennials go straight to the internet to start their search before they do anything else. That means the listing must be perfect in every way or the millennial searcher will move on to one that appears to be better. Millennials also will look for a quality home with less emphasis on size. They also, for the most part, want to be near big cities that offer a low cost of living, walkability, public transportation, as well as a high-tech, low maintenance lifestyle. Which means they want smart homes with smart appliances, as well as energy-efficient homes, and if a home doesn’t have these features, the seller can expect to receive lower offers. What Do These Trends Mean for Buyers? What these trends mean for buyers is that even though the interest rates have risen a bit lately, they haven’t risen all that much. So it’s still a great time to buy. Additionally, if buyers want to save the most money, they should opt for a 15-year fixed rate mortgage over a 30-year mortgage if at all possible. Also, millennial home buyers will be competing with a variety of other buyers; therefore, it’s important for millennials to prioritize their wants and needs, especially if their preferred location has limited inventory. That’s why it is so important that the millennial buyer prioritizes their wants and needs, knows their budget, and is firm about sticking to it. They can also try other tactics such as appealing to the seller with a personalized written letter, and any other persuasive tactic they can come up with to secure the deal. In addition, hiring an experienced real estate agent is probably the single best thing a buyer can do to make sure they get their first choice of homes at the best possible price. Is 2019 Going to Be a Buyer’s Market, Balanced Market or Seller’s Market? Obviously 2018 was a seller’s market; however, it appears that trend is changing. You can expect 2019 to be a balanced market because the trend of rising inventory and interest rates which has led to reduced buyer affordability and sellers having to drop home prices. In addition, these issues have resulted in an increase of inventory that is staying on the market longer which means sellers have to be more flexible if they want to sell their homes more quickly. Another issue that seems to dictate consumer confidence is how well the stock market is doing. Declines in the stock market and economy shake consumer confidence and if these random drops in the stock market continue, it could change the way home values are perceived leading to a balanced market. Should You Be Worried About a Housing Bubble in 2019? Everyone has an opinion about when and if there will be another housing bubble. However, history tells us that as long as people are employed, wages are rising, and the GDP is growing, a housing crash isn’t likely. Additionally, housing prices are stable, the economy is strong, and there is still a significant demand for homes even in light of the relatively minor interest rate increases. Now, with that being said, history also tells us that anything could happen and a housing correction is always a possibility. There is always that possibility of a “perfect storm,” which means a variety of factors have to come together to cause a housing crash. For example, the key factor in a housing crash is a recession. Other factors include the current trade wars because these could cause the economy in other countries to collapse, creating a domino effect that could send our economy into a recession as well, which could, in turn, result in a housing crash. So the bottom line is…there’s really no way of knowing which way the tide will turn. But that is nothing new. Don’t wait for the tide to turn. If you are thinking about buying and/or selling a home, please Contact Us today. We would love to provide you with a market comparison that would give you all the information you need to make an educated decision about which route you want to go in 2019 and beyond.